Ohhhhh Friday, I love you. Do any of you remember how we (or at least me), loved Fridays for totally different reasons than we do now? I could hang with the best of 'em on Friday night...I had all day Saturday to catch up on sleep after all. Now, however, Friday nights are usually for something way different. I actually look forward to downtime. Time to relax. Time for calm. And time to unset my alarm (allll of the yesses to that last statement). My Friday night routine, actually, typically starts out a little early with AVEENO® products from Walmart, in the late afternoon and this habit has quickly become the easiest way to treat myself after a long week. Come on ladies - every single one of us needs a treat every now and again, riii-iiiight???? So, Friday nights now include less socializing, but way more treats and I'm able to do this, all with the help of AVEENO®. I like to start the weekend with a quick workout followed by my longest shower of the week. Here's where AVEENO® comes in. Treating my tresses with AVEENO PURE RENEWAL® Shampoo and Conditioner feels a little like a mini-hair salon, right in my bathroom. The rich scent smells amazing without being overwhelming. Scent aside, the sulfate-free formulas leave hair shiny, healthier looking and more full of life by re-balancing hair's optimal moisture. This duo is great for sensitive scalps and both are dye-free, paraben-free and are even safe for colored treated hair. Oh, and did I mention they smell fabulous?!? I kid, I kid...although I couldn't remember what day of the week it was when I woke up, so, you never know:) And here's a bonus, the AVEENO PURE RENEWAL® Conditioner is lightweight so hair is soft and moisturized without being weighed down. Yay for volume! After an ample hair washing, next on my list is a little leg shaving action. I know we all enjoy this time-honored tradition of smoothing our skin (yes, that's sarcasm), but AVEENO® has us covered in this department as well. AVEENO® POSITIVELY SMOOTH® Shave Gel is ahhhh-mazing y'all! Specially formulated with an exclusive combination of natural soy extract, oat, aloe, vitamin E and skin conditioners, it has been shown to naturally minimize the reappearance of unwanted hair. Needing to shave less often? Ummm...sign me up! Because it immediately softens and conditions hair, getting a close smooth shave is a breeze. AVEENO® POSITIVELY SMOOTH® Shave Gel is actually the #1 recommended OTC shave gel brand by Dermatologists in the USA...that’s good stuff my friends! 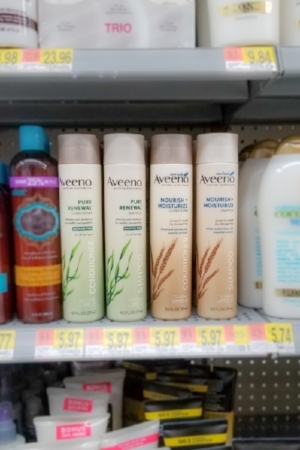 These, plus many more AVEENO® products, can be found easily at your local Walmart store, so the next time you shop, be sure to pick them up. Your Friday nights will never be the same! As with all products, for best results, be sure to follow package instructions. If you would like to save $2.00 (duh, of course you’d like to save $2!) 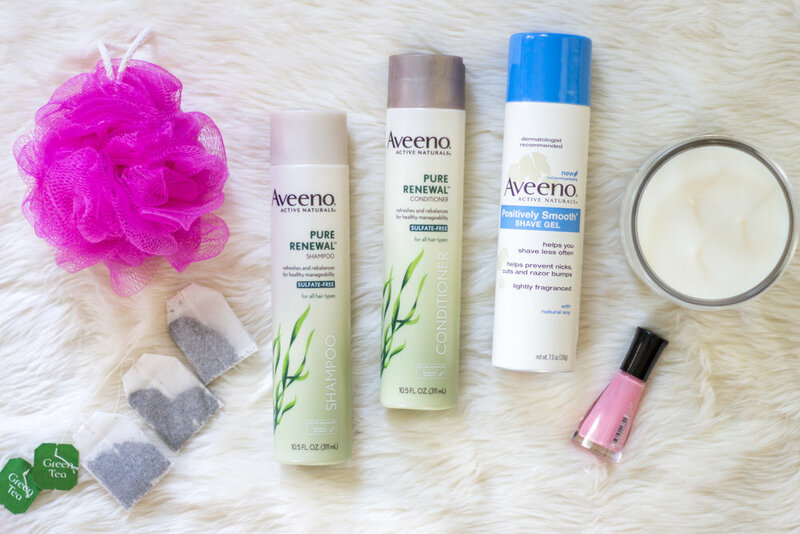 on your next AVEENO® purchase just Click Here loves. I’d love to hear from you - how do you treat yourself on a weekly basis? Let me know in the comments below!